Day 2 of RootsTech 2019. Here is my take on Thursday's happenings from the viewpoint of someone who is #NotAtRootsTech. 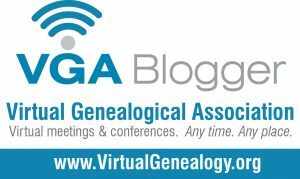 Making the Leap—Becoming a Professional Genealogist (Power Hour) --Luana Darby, Valerie Elkins, and Anne Teerlink If you are thinking of going professional as a genealogist, this session was so FULL of great information. Make sure you download the handout. This presentation made me so glad that I have never wanted to go Pro. Not that I don't aspire to have my research at the professional level. So glad they are now streaming the Q & A for the sessions today. Trish told the story of how the German Church Records were saved by Paul Langheinrich. These are on FamilySearch and she showed how to navigate to them either using Records or Catalog. I also enjoyed the case study by Karl Bodamer. Loved the use of the Geogen site. This has given me several ideas on where to search when working on my daughter's paternal lines. Thursday General Session: Patricia Heaton--It was fun hearing from Patricia Heaton. She's a funny lady. She was so excited about her DNA reveal. YouTube feed was not working on this Livestream but I did manage view via the RootsTech.org homepage. I think everyone wanted to hear what Crista had to say and that broke the feed. She talked about the new tools at Ancestry: MyTreeTags™, DNA Matching List. and ThruLines™. ThruLines have replaced DNA Circles although you can still view your circles at this time if you have DNA tested. What's important to keep? Preserving your personality. Who should inherit specific items? Organize and explain what you can now. Preserve your digital materials. Who will you pass the torch on to...who will best preserve your precious items' She also brought up the need for a Digital Will. Definitely, something to think about. Love the case studies especially the one of the letter found in the WWI records. An amazing account! I've been researching for almost 30 years. I need to revisit ALL of my earlier research. Sometimes we build our own brick walls.. The official announcement of the new Ancestry Tools. Also monitoring social media and genetic genealogy Facebook group members' post as they worked with the new tools was insightful. The announcement that GeneticAffairs' AutoClusters would be coming to MyHeritage was officially made and that option appeared on my account at MyHeritage this morning.